He's known as more of a defender and rebounder, a player who hustles after loose balls. But he will now be known as the player who hit the game-winning three-pointer at the buzzer to send his team to the championship game. 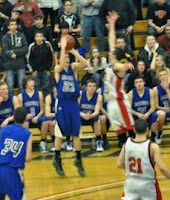 Senior forward Dillon Lanctot hit the shot, and as a result the #3 seed Somersworth High boys basketball team defeated #2 seed Berlin 55-52 in the Division III semi-finals on Tuesday night at Southern New Hampshire University.